Made in China is a large-scale sculpture addressing distributed authorship in the contemporary crafts context. 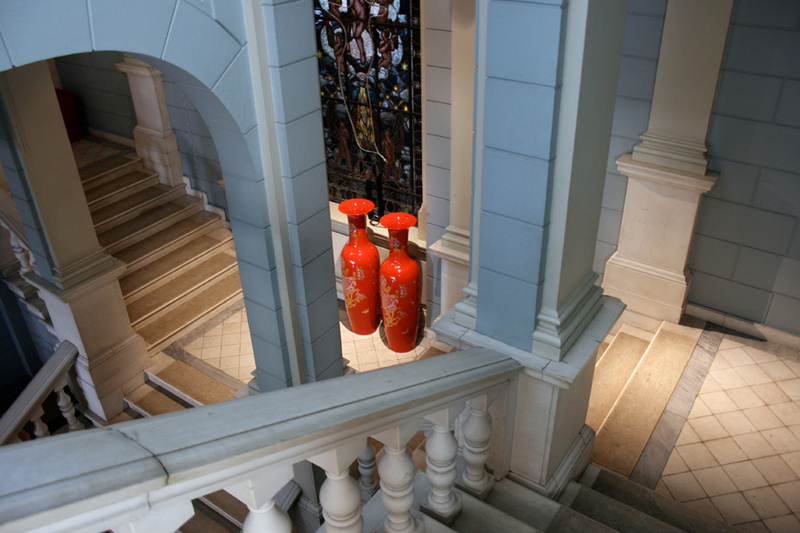 The work was presented at the West Norway Museum of Decorative Art for the international exhibition, Thing Tang Trash. 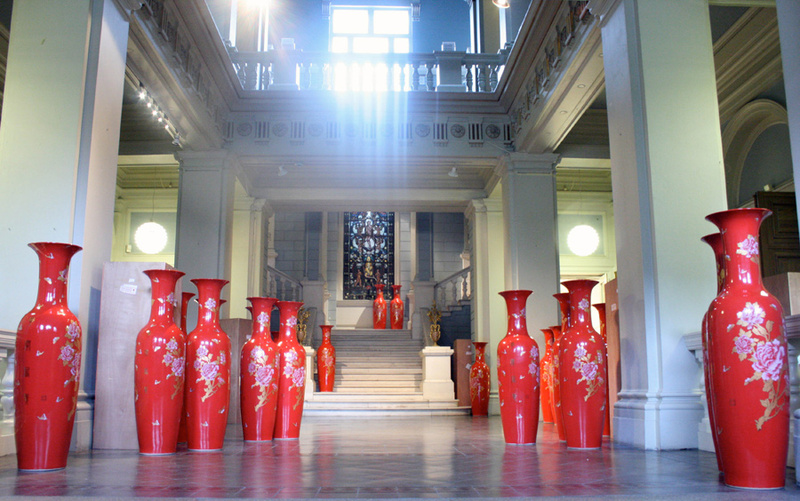 The work comprises of 80 porcelain vases, each 1.5m tall, produced in Jingdezhen. Seventy-nine were decorated at the Chinese factory using transfers; one was hand decorated at Royal Crown Derby using 18-carat gold. The latter took longer to complete than the 21 days it took to complete the 79. 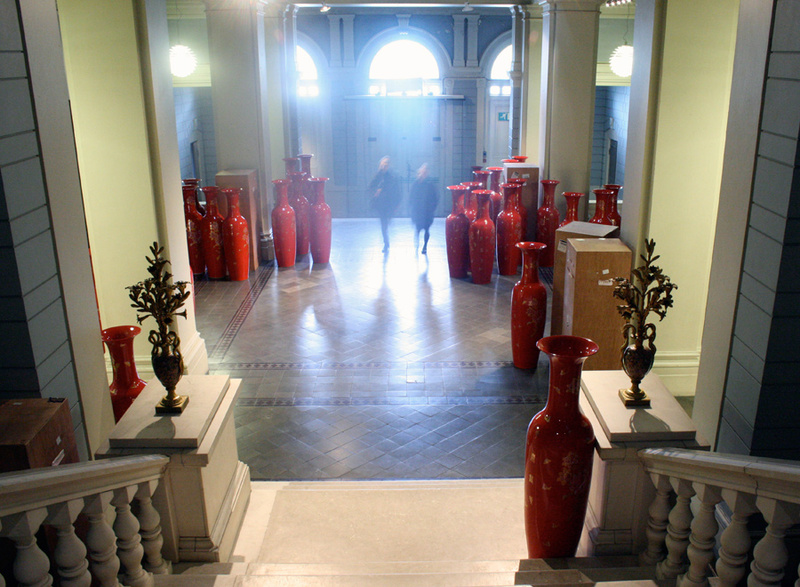 The vases were shipped to Norway by Twomey, in large wooden crates, and installed across the ground floor gallery. 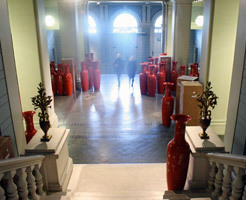 The installation of the 79 vases greeted visitors and drew them towards the main exhibition space, where the Royal Crown Derby vase was placed. Visitors could walk round the work or in among the pieces. Whatever we buy these days, there is a good chance that it will be labelled 'Made in China'. This is also the case for the vases that Clare Twomey has had especially made for the exhibition Thing Tang Trash. They were made in Jingdezhen, China's leading porcelain production city. Porcelain goods have been produced here for nearly 2,000 years. The inflow of Western artists and designers has increased steadily since China opened up to the outside world and adapted to a market economy. Jingdezhen is a place where it is possible to work on a greater scale and with greater volumes than most other places, and the costs are far lower than in Europe. 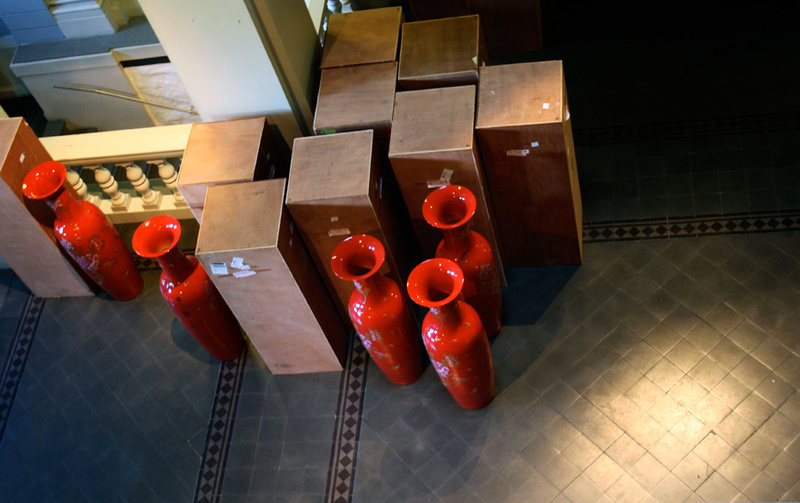 Twomey ordered eighty vases. They were cast in several pieces, and the vases were then assembled and the joins and surface smoothed by hand. This can be seen as tiny nuance differences in the surface and form of the vases. Nonetheless, they have a certain mass production feel about them. The decor is on the surface and can be easily scraped off. The golden colour is not real gold, and the shiny quality and the stiff drawing make the decor seem cheap. The vases are more kitsch than art. This is particularly evident when you compare them to the one vase that was not decorated in China, but was sent back to England to be decorated by Royal Crown Derby. This company is known for high quality, and not least for its use of gold decor. They have used the real thing: 18-carat gold. The pattern lies deep within the glaze. Like in China, decals have been used, but these cannot be scraped off so easily. 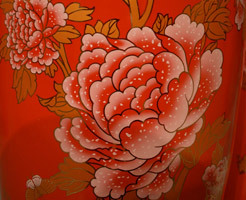 The flower motif is also much more refined and detailed than in the Chinese version. 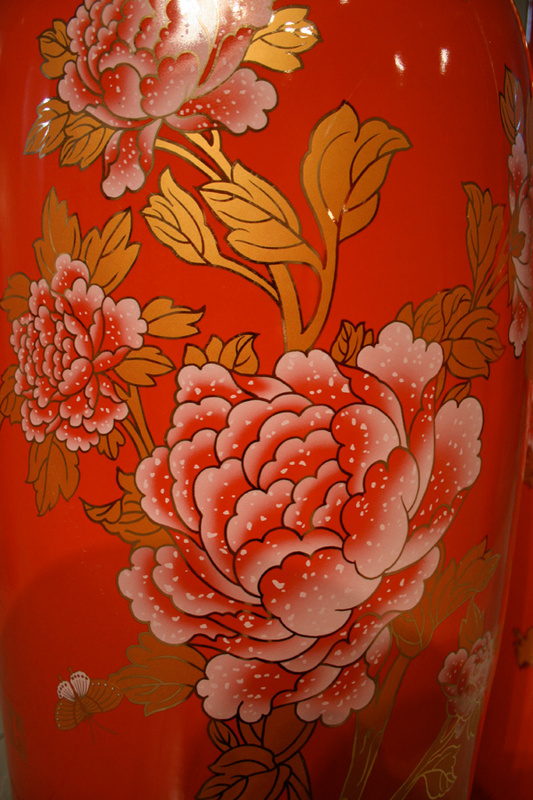 It took the Chinese 21 days to produce and decorate 80 vases. Royal Crown Derby took as long to decorate one single vase, and the work cost more. These simple facts explain why so much production is moved from Europe to China at present. Time and money are important factors in all production. The question is what more we lose in addition to the jobs and knowledge. Is the decor work carried out at Royal Crown Derby worth as much more that it justifies the high price? Maybe it is just a matter of differences in taste? Should we let the market govern what production survives, or do we have a responsibility to maintain high-quality production that cannot be profitable? For example, Royal Crown Derby cannot automate its production. The company is based on manual work carried out by expert skilled workers. Today, Royal Crown Derby is the only company in the industry whose entire production is located in Britain. The juxtaposition of the many and the single vase makes us think about the differences. Maybe it is not a matter of choosing between Jingdezhen and Derby. Maybe they cannot replace each other, but rather complement one another? Royal Crown Derby is not able to make vases like they can in China, but they are the best at gold decor. In this special vase, different knowledge, skills and traditions meet. If we wish to maintain this balance in the future too, we will have to define companies such as Royal Crown Derby as cultural heritage worth preserving. 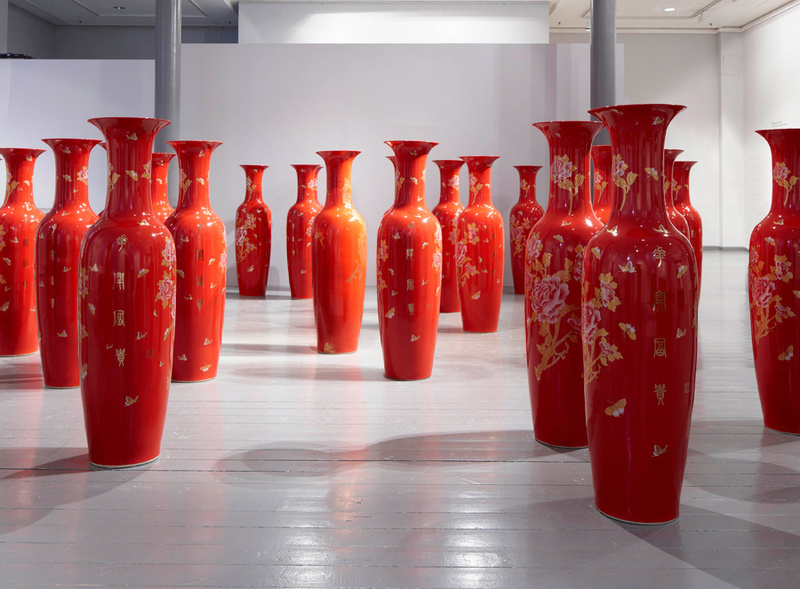 In recent years, ceramic materials have increasingly been used conceptually to explore issues such as rapid modernisation (in the case of Ai Weiwei’s ongoing series of ceramic works that ironically reinterpret historic Chinese artefacts) or the environment, as Mineo Mizuno has done. Other artists, such as Keith Harrison, Linda Florence and Phoebe Cummings, in the UK, have realized projects with the help of teams of skilled collaborators, but the collaborative process is not seen as intrinsic to the work. Made in China examines ceramic-making as a shared dialogue between geographically distant places, bringing the discussion of distributed authorship to the fore – not as means of making, but as reason for making. 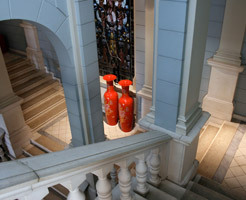 In addition to seeking to question the changing role of the craftsperson as singular authorial agent, Made in China asks how contemporary art ceramics can develop as a more expansive practice able to confront conceptual and critical issues concerned with globalisation and the ways that ceramic artefacts come into being within and through distributed social and commissioning networks. 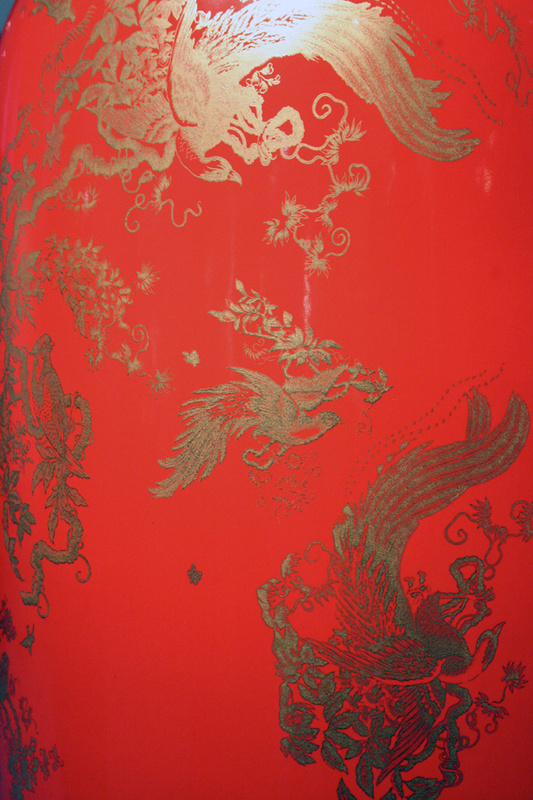 Initial research involved sourcing a manufacturer in the Chinese city of Jingdezhen, who could produce a series of large-scale vases. 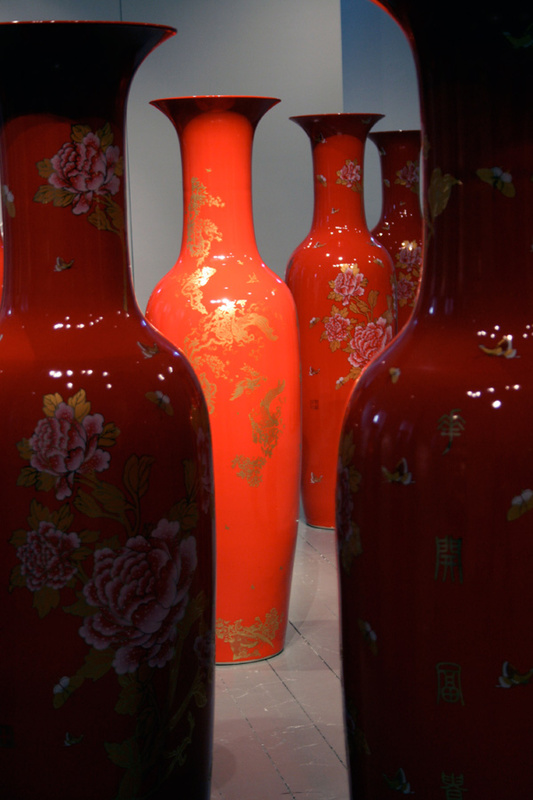 After establishing by email a good working relationship with a factory, 80 vases were ordered. 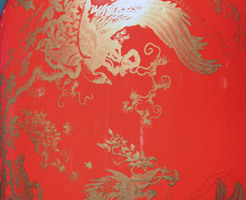 The artist chose the shape and colour and the pattern was selected from a range of predesigned motifs. Following this, the manufacturer agreed to ship one blank vase to Royal Crown Derby in the UK for the factory to decorate with a British design. This process allowed the artist to compare the working methods of the manufacturers. The artist shipped the work in a large container lorry to the museum in Bergen, where they were installed in the entrance to the exhibition to introduce its concept and themes. 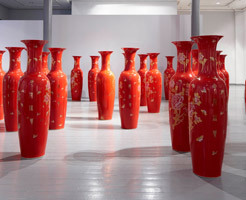 Made in China challenges traditional perceptions of ceramic-making both through the large-scale nature of the installation and its realisation by multiple artisans. In particular, the project extends the critical and thematic scope of the subject area by showing how ceramics practices can engage with the topic of globalization by engendering, organising and nurturing distributed creative, collaborative and material processes. In addition, the project aligns itself with conceptual art practices by highlighting the function of the processes that bring manufactured ceramic objects into being (ie, as a set of instructions, commissioning processes and distributed conversations). To put this another way: the project exists as much in its immaterial processes as the final material objects installed in the gallery. 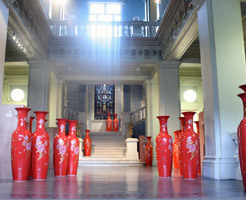 Made in China grew out of an artist-in residency scheme at the V&A ceramics gallery in 2011. Over a period of seven months Twomey specifically researched changing and migratory conceptions of skill and craft knowledge in ceramics practice. The project began with a survey of the ceramics collection in the course of which a small, 13th-century blue and- white tea bowl made in Jingdezhen was discovered. As a ceramic artifact that had travelled significant distance both historically and geographically it became a pivotal influence in establishing Made in China’s conceptual themes. As part of a live performance staged at the V&A, the artist held a dialogue with a skilled craftsperson from Wedgwood as she demonstrated four hours’ worth of hand-painted plate lining. Public perception is that normally such work was done by machine, as feedback from the V&A audience confirmed. This prompted questions about, for example, migrating craft skills and the persistence of skill in ceramics manufacturing, that directly fed into the later Chinese project. 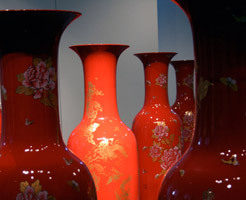 Made in China consists of 80 highly decorated vases made in a Jingdezhen ceramics factory, which is situated close to the site where the 13th-century tea bowl had been made. One of the bowls was decorated in 18-carat gold by Royal Crown Derby after being shipped to the UK as a blank vase. The skills used by the two companies were very similar, but their production capabilities, and capacity for scale, very different. Production was achieved in China, exactly three weeks from order, an almost unheard of timetable for UK manufacturers, highlighting significant differences in industrial capabilities between countries. As the project was commissioned from China and the UK, to be delivered to a museum in Norway, the project ‘lived out’ its conceptual themes as a ceramic work that came into being via a network of culturally and geographically distributed artisans. 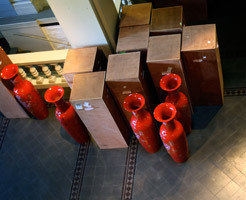 Shipping the various parts of the work from China and the UK to Norway presented significant challenges and the artist personally undertook to accompany the vases from their site of production to the museum. The work was delivered in a large container lorry and was carried by hand into the gallery space by a team of four people over four days. The work was centrally placed in the museum, dominating the space and providing a conceptual and material entrée to the exhibition. The Royal Crown Derby vase was hidden among the Chinese pieces, encouraging exhibition visitors to explore the installation and reflect on the issues it raised. During the period of the show, Twomey spoke at the accompanying conference about the conceptual themes of the work, ie, skill migration, collaboration and globalisation.